"Cleveland's most romantic outdoor dining!" When we ask our patrons "How is everything?" we regularly receive a nod of affirmation that we've provided a lovely dining experience. A recent answer to that question was, "Cleveland's Most Romantic Outdoor Dining" experience. We take extra pride in that response. Since the 1950s, our garden has been the setting for romantic dinners for 2, engagements, rehearsal dinners, bridal showers, renewals of vows, anniversary parties, and even weddings. I hope our photos of the garden illustrate the environment, but in case words are more palatable... Consider yourself seated on a European-style brick patio, alongside a century-old fountain, surrounded by the beauty of 50 year old Italian grape vines, and the wondrous fragrances of trumpet vines. 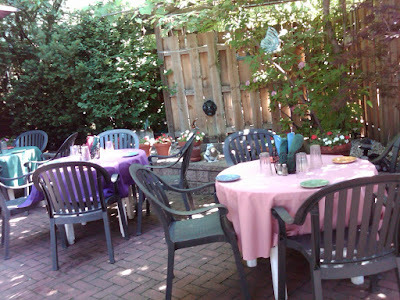 For reservations in the Garden, call 216.231.3100.